AP photojournalist Horst Faas took this iconic photo on June 18, 1965, during the Vietnam War with the 173rd Airborne Brigade Battalion on defense duty at Phouc Vinh airstrip in South Vietnam. 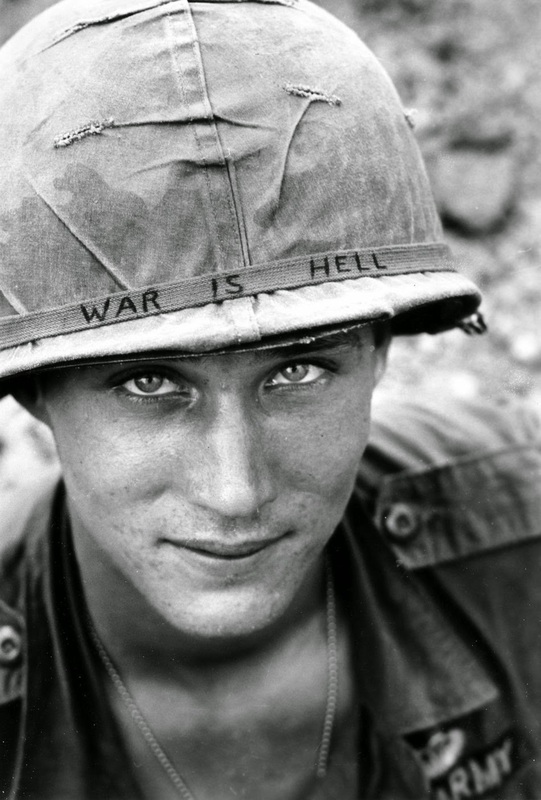 The headband message “War is Hell” typified an acerbic attitude of many young American soldiers who were likely drafted and sent to the remote southeastern Asia jungles to engage in deadly and terrifying combat. A lot of the soldiers wrote graffiti on their helmets with inscriptions of their attitudes about where they were and why they were there. The identity of the soldier was unknown for many decades until recently when he was identified as Larry Wayne Chaffin from St. Louis. He served with that brigade in Vietnam for exactly one year beginning in May 1965 and when the photo was taken he was 19. Chaffin had many problems adjusting to civilian life when he returned from Vietnam. He died at the age of 39 from complications that arose from diabetes, an ailment he might have contracted from exposure to Agent Orange while serving in Vietnam. He died in 1985. (Photo credit: Horst Faas / Colorized version ). In a book I read long ago about his march to the sea the quote is said to have originated from a heated conversation with a southern woman. She complained about the hell he'd made of their lives.He answered "Madam war is all hell" or "All war is hell". Remind anyone of Bogey's "Play it again Sam? Humanity, a loving son, brother, friend a good kid. His life change in every way, because of the war. God bless him and his FAM. And all the kids that r in the army and navy. Tried to use pot and an array of drugs and ell into oblivion! Died at 26 a destroyed young man with so much talent!!!!! I thank all the young men in our Military who never received a word of appreciation for their service to such a bunch of lousy ingrates whom these kids fought and died. GOD should never forgive them. Our kids saw the horrors of hell and came home to be spit at, jeered and tormented and suffered in their minds when they should have been praised and blessed with the love of all who call themselves Americans, they went to viet nam because of their love of America and their fellow man..To those who scorned our Military, you should be so ashamed to the depths of your soul, I don't know how you've ever benn able to sleep. Served your country or do You mean destroyed another one. How did they serve it?!! Do you also see the war and destruction of Iraq that have durated in 25 years which Obama among others celebrated, as "a service to the country". I hate America as a nation but I think people in general with a regular mind and heart are nice. Don't be grateful that they destroyed other countries. I too feel bad that they also got sick, but don't say they are serving their country, the country just didn't appreciate them so much and gave them to death meanwhile "servinge" the country. An Iraqian women who hates the american politicians because they destroyed and are still destroying my country and all civilians in it. I wish to have more info! You see when my sister was born this same face appeared at the corner of her image.. I've kept this in the past until I came across this face on pinterest my mom screamed and got goosebumps seeing it... Our family has always had supernatural things happen even though we are now Christians. Then, we had a priest and a spiritual woman try to figure out why he appeared and told us he was in the war long ago. My sister was born in 2011. I wish the image never disappeared. I wish to know more of this man who fought for our country... Maybe to understand why, if it were him. Those piercing eyes still reside in my mind. For years. If any of the family can contact me somehow? For closure. The man in the picture is Larry Wayne Chaffin. I'm his granddaughter, if there is anything you would like to know, I would gladly help you.